Protect your hands in any situation from landscaping to welding. 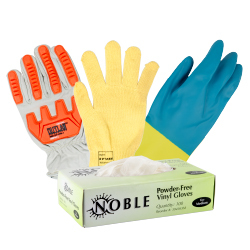 We offer gloves in a variety of materials including leather, cotton, and stainless steel mesh. 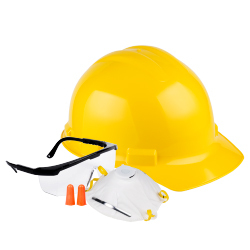 Our wide range of personal protective equipment has what you need to keep your head, eyes, and ears protected when working on the job. Give your staff full body protection with protective clothing and suits designed to wick away water, draw attention, and protect clothing. From power outages to small fires, we have what you need to be prepared and react quickly with our emergency readiness supplies and equipment. We offer crowd control stanchions and fences designed to keep your large events under control with the use of stanchion ropes, signs, and fencing. 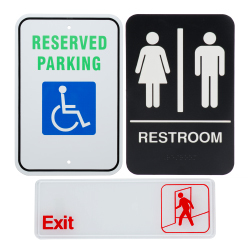 Convey important messages such as handicap parking or private property notices in a professional manner with these information and compliance signs. 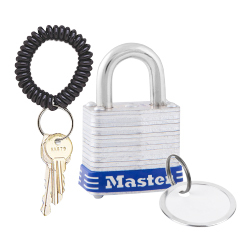 Great for high-risk areas or high-security establishments, you can keep valuables locked away with the help of these locks and key organizers. 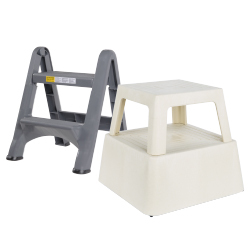 Provide your staff with a safe way to access higher areas in your storefront, warehouse, or kitchen with these step stools and ladders. 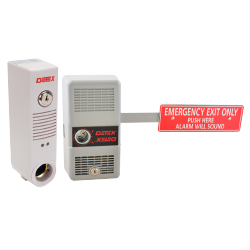 Exit door alarms alert staff and patrons to an emergency by signaling when an armed door has been opened. Great for hot kitchens or warehouses, cooling towels bring relief to workers in an effort to reduce fatigue and avoid heat exhaustion. 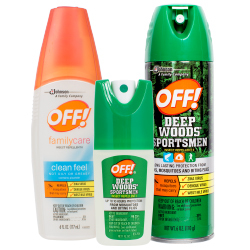 Perfect for construction sites or landscaping projects, these personal insect repellents protect against bugs that may bite or transmit diseases. 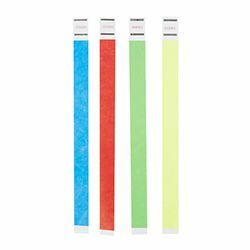 Make it easy to instantly identify medical patients, guests, workers, or customers with the help of these disposable wristbands. 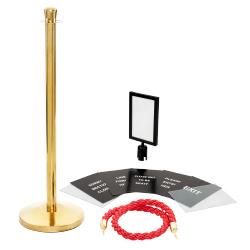 Whether you're looking to install lighted signs to illuminate the exit doors in the event of an emergency, mark off an area with caution tape, stock up on an additional fire extinguisher, or invest in other safety products, we’re sure to have what you need. We also offer the best first aid kits and supplies for treating common injuries and accidents. By maintaining a safe establishment, your employees will feel confident during their workdays, and your guests will feel comfortable during their visits. You may also find our selections of commercial floor mats, janitor carts and caddies, and wet floor signs helpful for your day-to-day operations. If you're wondering where to buy safety and security products, we have a large selection of safety and security products for sale at the lowest prices. Do your business’s cut resistant gloves make the cut? Hand cuts and wounds are preventable accidents in the workplace, yet they account for a hefty percentage of injuries and lost employee time in the United States. Protecting employees’ hands in the foodservice industry should be a high priority, but choosing the right cut resistant glove for your work environment isn’t the easiest task. Below you will find a guide to help you determine the material and glove that best suits your business’s protective needs. Having a fire extinguisher is crucial to the safety of your restaurant, your employees, and your customers. It is therefore important that you understand associated components and terminology so that you know how to choose a fire extinguisher that’s right for you. If you operate a five-star restaurant, movie theater, university dining hall, special events venue, or any other public facility, these safety and security products are necessities for you. If an emergency occurs, it’s important for your staff to be prepared with the proper tools, so they can handle and control the situation in a timely manner. 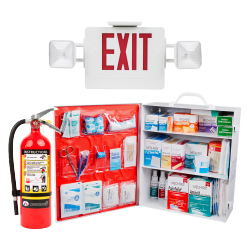 React with our fire extinguishers or first aid kits, or help prevent emergency situations from occurring by implementing crowd control signs or safety fencing. 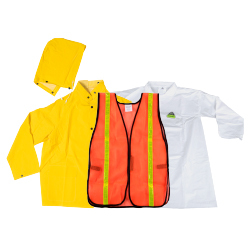 We offer a large variety of apparel and personal protective equipment to be used in any situation. Provide kitchen staff with the necessary gloves including dishwashing gloves, kitchen gloves, disposable gloves, and freezer gloves. If your construction crew is working roadside, make sure they’re visible to oncoming traffic thanks to safety vests and shirts or hard hats. We have anything you need to prevent accidents, keep staff safe, and react swiftly to emergency situations.